Napier Sportz SUV and minivan tents are now available to fit tons of sport utility vehicles and minivans. When you are fumbling around in the dark trying to set up your tent before the rain comes in, you will be glad that you have chosen a Sportz SUV minivan tent. These SUV tents feature the highest quality nylon taffeta, all metal zippers with an extra-large zipper fob on them to warrant easy gripping when you need to close the door or windows. Napier uses only the highest quality fiberglass for the poles which will give you the sense of security you are looking for while you are laying in the tent at night and hear the winds whipping around the camp site. Sportz SUV tents also come fully equipped with a high quality rainfly; and easy installation instructions. You will have the peace of mind in knowing that the floor is completely coated with polyethylene to ensure no moisture gets through. Napier has thought of everything when they designed these tents, they even have a rip-stop protection covering the entire floor and no-see-um mesh on all the windows. You will be able to hear the mosquitoes buzzing around the windows trying to get in, and be able to laugh at the fact that they will never be able to squeeze through the tight knit mesh covering all the windows. Having this type of mesh on the windows allows you to keep them open to ensure full ventilation throughout the entire tent. 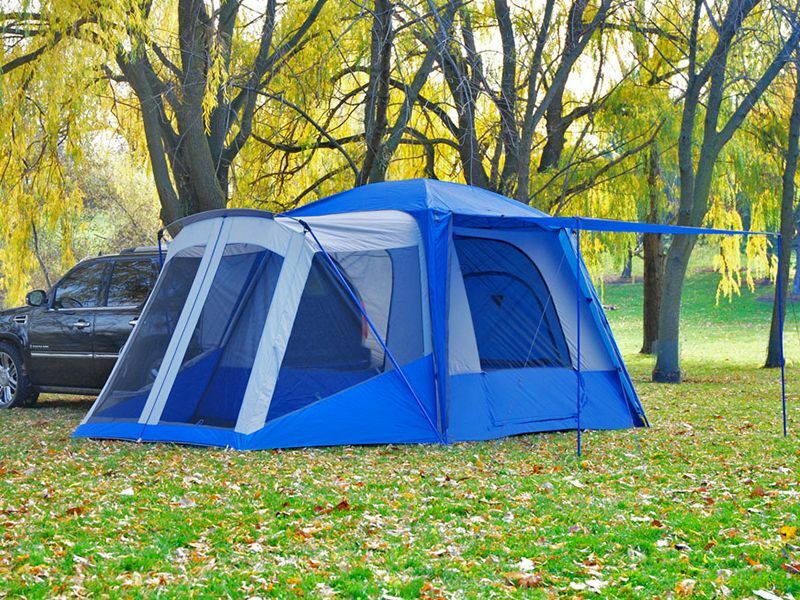 With all these great reasons to buy a Napier Sportz SUV or minivan tent, you would think they would be difficult to set up; not the case with these tents. Set up is a breeze, and you even have the option to detach the tent from your SUV or minivan using the detachable sock. This option comes in handy when one of your children need to use the bathroom in the middle of the night and are afraid to walk through the great outdoors to the community bathroom. Enjoy your next traveling adventure or camping trip with a Sportz SUV & minivan tent. Made by Napier Sportz Tents. The Sportz SUV and Minivan Tent by Napier Enterprises is an easy set up and comes with easy to understand instructions. For additional information, please call us at 1-866-309-1907 or 701-253-5906.